Publicat pe 26 august 2014	de Cristi M.
The Scala dei Turchi („Stair of the Turks”) is a rocky cliff on the coast of Realmonte, near Porto Empedocle, southern Sicily, Italy. 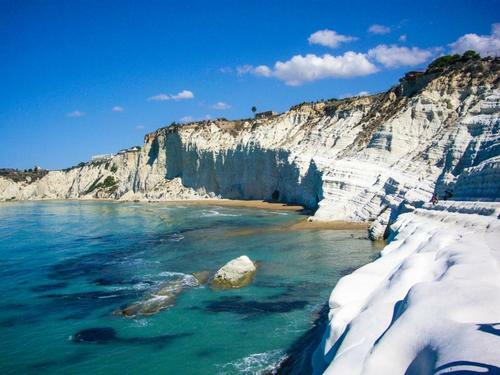 It has become a tourist attraction due to its unusual white color, as well as by its mention in Andrea Camilleri’s series of detective stories about Commissario Montalbano.The Scala is formed by marl, a sedimentary rock with a characteristic white color. It lies between two sandy beaches, and is accessed through a limestone rock formation in the shape of a staircase, hence the name. The latter part of the name derives from the frequent raids carried on by Moores. Acest articol a fost publicat în Photos / Quotes și etichetat italy, Scala dei Turch, Scala dei Turchi, Sicilia, Stair of the Turks. Pune un semn de carte cu legătura permanentă.